Thanks to my grandfather’s Latvian physical therapist, I got plenty of on-the-ground advice. She connected me to folks from back home, so huge thanks to my new Latvian buddies Mara, and particularly Zane, for the help — I’m sure what I ended up cooking was tastier and more authentic because of your suggestions. 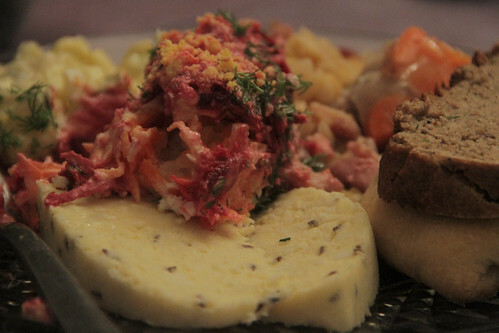 The heart of Latvian food is similar to its Balkan neighbors’ — fish, preserved and roasted meats, root vegetables, some dairy — though with even more of an emphasis on rye than I saw elsewhere. Not only did we have two types of rye bread, we also had a drink and a dessert made out of it! We also enjoyed stories, artwork, and photos from Bill, our guest of honor who lived in Riga, the capital, while managing Peace Corps operations in the Baltic states in the mid-90s. 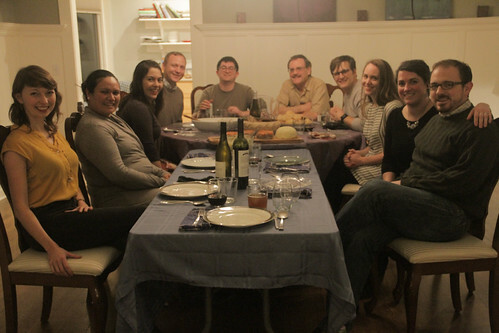 Our other guests were Haley, Alondra, Annette, Jason, Jens, Molly, Sarah, and Estel. This is a soda made from rye bread. Yes, it’s weird, but not as weird as I’d expected. To me, it tasted like a bizarro version of root beer. I actually rather liked it! 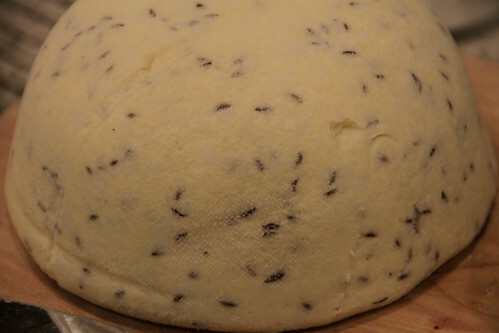 This cheese, traditionally eaten for the midsummer festival but now popular year-round, sure has a lot of ingredients! I’m not sure if it’s quite accurate to call it truly homemade cheese, since it starts with store-bought curds as a base, but given all the work done to it — regular and buttermilk, plus egg yolks and whites, not to mention the caraway seeds, and all that straining! — it certainly feels legit to say I made cheese. It sure looked right: nice and firm, lightly yellow, attractively flecked with seeds. Just one problem, it wasn’t nearly salty enough, and hence it was pretty bland out there on the table. The recipe said “salt to taste,” which to me makes sense for something easily adjusted like a sauté or a stew, but in hindsight I should have looked to another recipe for guidance on how much to use, since by the time I could actually taste it as a cheese, it was too late. Oh well! The dough is fun and relatively easy to work with, as all that butterfat makes it so nice and soft, and so long as you get it all wrapped up you don’t need to worry too much about the shape. The real genius of this recipe, though, is that by using uncooked bacon as the filling, you get the fat to render inside the bun, and hence to drop into and crisp up the bottom. Really, really delicious! I could see bringing these to a potluck. By the time I went to the store, I’d trained my sourdough starter on (standard) rye flour, so it was ready to go to work overnight on the pumpernickel. The recipe starts out looking all precise with measurements for this much flour and that much caraway, but then, as so many bread recipes do, it evolves into trying to giving you a sense of what the bread should feel and sound like, and a suggestion to add dry or wet as necessary to make it right. Fortunately I’ve made enough rye breads now not to be intimidated by how ridiculously sticky it is, and resisted the temptation to add more than a little white flour, and the result paid off: a dense, but moist, loaf! I ended up making so much that even after what was served on the table with the meal, as well as the bread soup (see below), I was able to freeze a whole loaf. I’ll probably keep that for Lithuania! Yes, I made two breads, I couldn’t help myself. But this one’s rather different. Instead of water, it uses apple cider as the liquid, adding the “sweet” to add contrast to the sourdough. The recipe didn’t at all specify whether this was to be hard cider, or simply pressed apple juice, but since I only had the former, that’s what I went with. 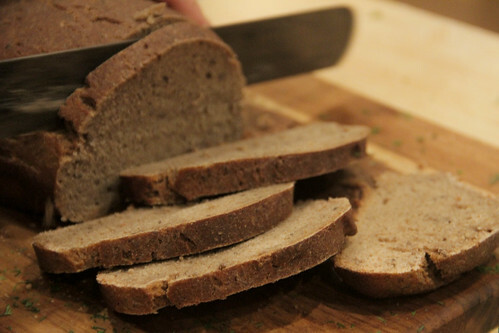 The resulting bread was really tasty, certainly lighter than the pumpernickel but with stilly plenty of that good ol’ Baltic rye taste. This, too, provided a full extra loaf for freezing. One admittedly excellent problem of living in a place where such excellent ingredients are available is they can throw a recipe out of whack. For instance, this jellied pork loaf recipe calls for 6-8 pork hocks plus a pound of meat, but the hocks at Tails and Trotters were so meaty that I got three of them plus an extra bone to make sure I’d have enough natural gelatin to make it set. It was still way too much meat! I saved about a pound for other recipes beyond what I made into this dish. 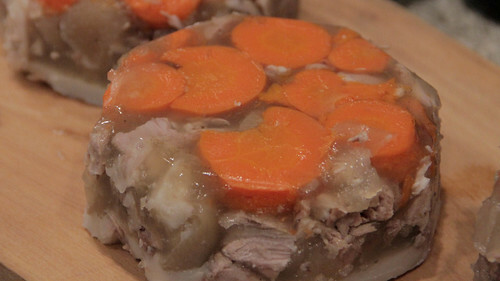 Not surprisingly, this was an odd one: bits of pulled-pork-soft meat and chunks of skin held together by pork-flavored jello, flavored with little more than salt plus some carrot slices on the bottom. The flavor was nice if a little bland. I regret forgetting the mustard to go with it, and I also read later that sometimes it’s sprinkled with vinegar. I had the leftovers a little later with mustard, and despite the odd texture, I found it actually pretty tasty. 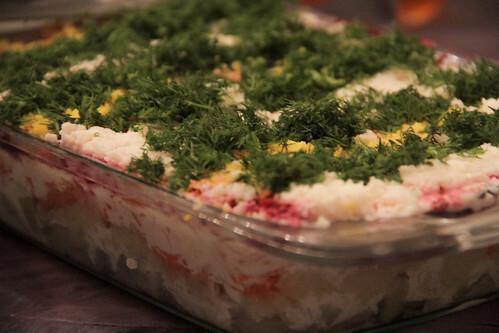 I call it the Baltic seven-layer dip. Instead of guacamole, beans, salsa, etc., you have a base of herring with beets, apples, potatoes, and a mayonnaise dressing. We had something very similar for the Estonian meal, and I’ve seen it at Russian markets, so it’s clearly quite a thing. And pretty much everywhere, it seems to be called “herring under a blanket” or “herring in a jacket.” It’s an ingenious way of using cheaper and filling ingredients to extend the intense flavor of the herring. I really enjoyed this dish. The apples provide a crunchy contrast to an otherwise mushy dish, and the flavors run the gamut from fishy to earthy to sweet to herby (from the dill) to, well, whatever beets taste like. With a mayonnaise-sour cream dressing holding it all together, it’s pretty much a Slavic sampler platter minus meat! One of those hidden gems that doesn’t sound or look like much, but is actually really darn tasty, especially if you use high-quality bacon. 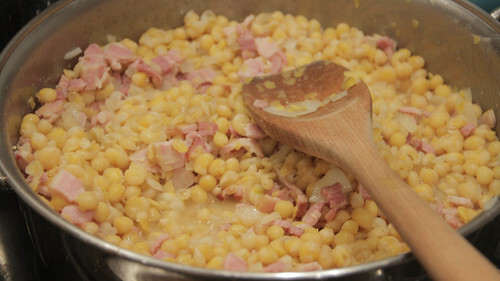 The hardest part of making this dish is finding the dried, round, grey peas. After that it’s a cinch to boil them, mix with fried bacon and onion, and that’s it. Serve, enjoy. Soup for dessert, or rye bread soup, would be notable enough. 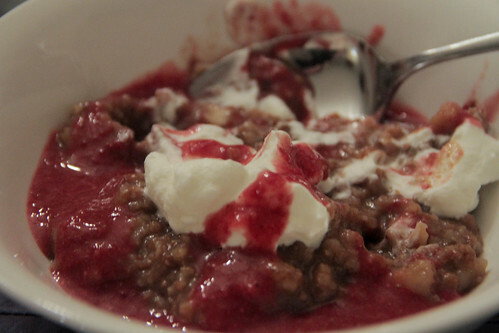 But a sweet, cold, rye bread soup for dessert? Leave it to the rye-crazy Latvians to come up with this one. In the tradition of French toast or panzanella salad, it’s a creative reuse of otherwise unpalatable old bread, with some cranberry juice and dried fruit to liven it up. I found it pretty tasty with that distinctive rye nuttiness, though it was really heavy for a dessert! Mix dry yeast with warm about a quarter cup of water and half a teaspoon of sugar, set aside to proof. Use a pot large enough to mix up the dough. Pour in milk, place on stove and heat, then add butter, sugar and salt. Don’t let it boil, just warm up and mix until butter is melted. 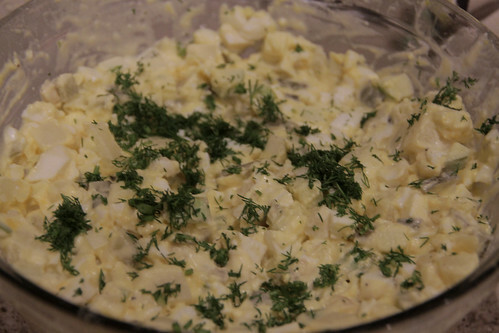 Remove from heat, add oil and sour cream, mix everything together. Then add risen yeast. Now you will have to use your palm. Add flour with your left hand and knead with the right hand. You can add one cup of flour right away, but then add in smaller portions. And then you have to see.. clap a bit dough.. if it comes of easy (jumps) from the palm when you lift it fast and is not too soft, the dough will be good. It should be sticky, but if it’s too sticky and doesn’t jump off your hand, then add more flour. Don’t add too much flour or it won’t puff up properly. That is the trickiest part! So when you have the right feeling :))) sprinkle flour over the dough and cover with towel. Leave for ~ 30 min to rise in a warm place.. then check and when the dough has risen, punch it down and let rise again. Preheat the oven to 410°F and prepare a work surface with flour. When the dough has risen, punch it down, take a large piece of the dough. Roll it into a rope 1.5 inches in diameter. Cut it to pieces about 1.5 inches wide. Roll out each piece into an oval. On one half of it, put a teaspoonful of the filling. Fold the dough over, pinching the edges together. Make sure there are no openings left, or the filling will leak out of the seam. 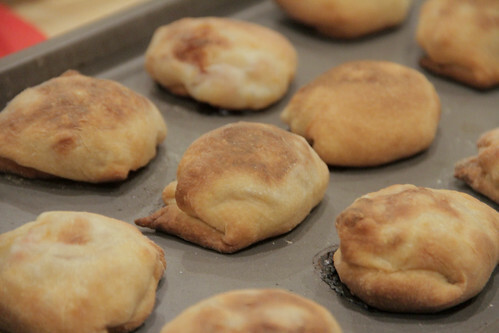 Place the finished buns on an ungreased cookie sheet, with the seams underneath. When pan is full let it stand a bit in warm place and then brush with beaten egg. Bake for about 15 minutes, until golden brown.